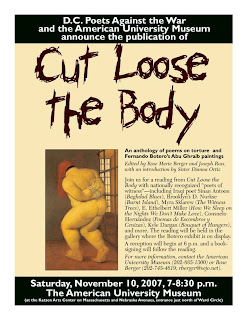 We are very grateful that this copy of Cut Loose the Body: An Anthology of Poems on Torture and Fernando Botero’s Abu Ghraib Paintings has found its way into your hands. We want the poems in this collection to establish a different kind of bond between you and those who are held without trial and subjected to inhuman interrogation techniques. We invite you to consciously remove your tacit support from the inquisitor and boldly step forward as defender of human decency and the rule of law. We ask you to do three things: Educate yourself. Talk with others. Act courageously. Educate Yourself: Write down three questions you have about torture, then look for answers to your questions on these Web sites: The Center for Constitutional Rights (www.ccrjustice.org); Amnesty International (web.amnesty.org); Torture Abolition and Survivors Support Coalition International (www.tassc.org). Talk with others: Host an evening to read the poems in this book and discuss with others what you’ve learned in the process of developing your questions and seeking answers. (Poets Against War offers tips on how to host a poetry reading at www.poetsagainstthewar.org/createreading.asp.) Consider showing the one hour interview between poet Robert Hass and Fernando Botero about the Abu Ghraib paintings (available on YouTube at www.youtube.com/watch?v=eGIa-9vCSto). Act Courageously: Send a copy of these poems to your local, state, or federal representatives and ask them to explain to you what they are doing to prevent torture in America’s name, what steps they are taking to close the Guantánamo detention camp, and how they are holding the Executive Branch accountable for preventing torture in any form. Include one of Fernando Botero’s Abu Ghraib paintings with your letter. These can be downloaded from Revista Diner (www.revistadiners.com.co/noticia.php3?nt=24663) and the Marlborough Gallery (www.marlboroughgallery.com/artists/botero/artwork.html). The true poetry begins where the words of the poems end. Your action in the world is pure poetry. Organizers of Saturday’s reading from Cut Loose the Body, an anthology of poems about torture and artist Fernando Botero’s works on Abu Ghraib, had set up a few dozen chairs at the American University Museum – an understandable expectation for an evening devoted to careful scrutiny of something we generally don’t want to think about – torture being committed by our government in our name. But the seats were all claimed well before the reading started, and rows were added until the supply of chairs was exhausted. And still people came, sitting on the floor and leaning against the walls, intent on bearing witness. The chatter of old friends greeting one another in English and Spanish contrasted with the silence in the surrounding galleries as people took in the disturbing and startlingly extensive exhibit – scores of works in oil, pencil, and watercolor featuring Botero’s trademark “inflated” figures brutalized and bloody, tied to cell bars, menaced by fierce dogs, tortured alone and in groups. Something about the hefty Botero figures brought to mind even more vividly the gaunt prisoners in the actual photographs from Abu Ghraib, and the surreal reality that the orders for the degrading and inhumane treatment that was now depicted before our eyes were given just a few miles away in the White House. The podium stood before a larger-than-life triptych of three prisoners, hooded and held in gloomy cells. Jack Rasmussen, director and curator of the American University museum, announced that, astonishingly, this was the only showing of the entire exhibit in any museum anywhere. How can that be? Shouldn’t every major museum in this country be bringing light to these dark truths? The readers were introduced by Rose Marie Berger and Joseph Ross, who edited Cut Loose the Body, a collaboration by the AU Museum and DC Poets Against the War. 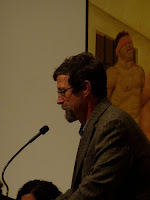 Ross said the goal of the project was, in the end, to say something simple: “We object to torture.” Berger spoke of the “Republic of Poetry” described by Martín Espada, a contributor to the anthology, and urged people to move beyond seeing the art and hearing the words into taking action by supporting Amnesty International and the Torture Abolition and Survivors Support Coalition. 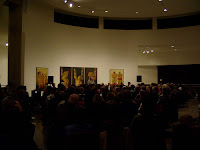 The evening featured several readers affiliated with American University, including associate professor Consuelo Hernandez, who also hails from Botero’s Colombia; MFA student Tala Rahmeh; and Myra Sklarew, professor emerita of literature and author of the forthcoming Holocaust and the Construction of Memory. NYC Benefit for Split This Rock! Mark Doty, Regie Cabico, and Kathy Engel are headlining a benefit for Split This Rock at the Bowery Poetry Club in New York City on Monday December 10. Tell all your New Yorker friends about this fantastic lineup and encourage them to help make Split This Rock a success. The reading starts at 8 p.m. Tickets are $25 at the door. See http://www.bowerypoetry.com/ for more details. Mark Doty will be featured at Split This Rock. The only American poet to have won Great Britain's T. S. Eliot Prize, Doty is the author of six books of poems, including My Alexandria (1993), which received both the Los Angeles Times Book Prize and the National Book Critics Circle Award. He has also published Atlantis (1995), Sweet Machine (1998) and Source (2001), and School of the Arts (2005), as well as the memoirs Heaven's Coast (1996) and Firebird (1999). Among his many other awards are two NEA fellowships, Guggenheim and Rockefeller Foundation Fellowships, a Lila Wallace/Readers Digest Award, and the Witter Bynner Prize. Doty teaches in the graduate program the University of Houston, and is a frequent guest at Columbia University, Hunter College, and NYU. He lives in Houston and in New York City. We thought our country had matured beyond this. But sadly, no. Torture remains a disgraceful part of our national vocabulary. U.S. officials continue to bend the language, refusing to say that even waterboarding is torture. We are baffled at our country’s blindness. But our frustration found a voice in Colombian painter Fernando Botero’s haunting “Abu Ghraib” paintings. When we learned the entire Abu Ghraib collection would be on exhibit at the American University Museum, Sarah Browning, coordinator of D.C. Poets Against the War, invited Rose Marie Berger (associate editor and poetry editor at Sojourners) and me into this project. We dreamed of a chapbook of poems on torture. 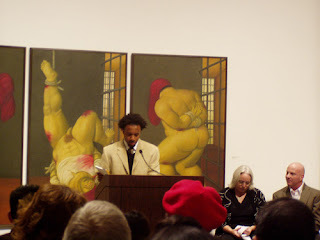 We imagined a reading in the gallery, surrounded by Botero’s awesome images. With that dream, we met with the director and assistant director of the American University Museum and to our shock, Jack Rasmussen, the director, was enthusiastic about the project. I think Rose and I had to pinch ourselves on the way home. Since that day, we received nothing but generosity and creativity from the poets we contacted. Poets from varied backgrounds readily responded to our invitation. Pulitzer Prize winner Maxine Kumin, E. Ethelbert Miller, Naomi Shihab Nye, Martín Espada, Sinan Antoon and others said yes. We wanted to include several poets from AU and they have some amazing ones. So, Myra Sklarew stepped up right away. Also, Consuelo Hernandez, who is also from Botero’s home of Colombia, responded to our invitation. We invited AU’s MFA students. Even the editor of a book of poems by Guantanamo detainees agreed to let us use a few of those poems. Among the poets we invited, we discovered the determined outrage to speak, using the language of poetry, about the horror of torture in our time. Cut Loose The Body is the fruit of this generosity. As we received the poems, we had to do some work with permissions, but that was not a problem. We selected 28 poems and then went to work on their order. Linking images, creating a visual thread for the reader, we felt was best. Another decision we had to make regarded the Preface. Who would we ask to write a Preface for such a serious collection? Rose and I both knew Sr. Dianna Ortiz, who directs the Torture Abolition Survivors’ Support Coalition. We approached her and she agreed. I can still remember the day she emailed me the Preface—and I have to say – I was moved to tears as I read it at my computer. Perhaps our final decision involved the title. Our first hope was to find a line or phrase from the poems themselves—and we did. We took several long, slow walks through all the poems with an eye toward a few words that might speak to all the poems and our hopes for the book. I made a short list and when I read them to Rose one day, and spoke Kyle Dargan’s words Cut Loose the Body, we knew we had found it. In the middle of September, we emailed our final version to Rachel Friedmann, the AU Museum’s assistant director. Rachel did a remarkable job of laying out the book and soon, it was at the printers and in our hands. Working with the generous people at the AU Museum was easy. Working with generous poets, who clearly wanted to speak on this, also was easy. And now the book is available at the AU Museum and through D.C. Poets Against the War. We invite you to share your thoughts here on this blog. We invite you to be part of Split This Rock. It is crucial that poets, artists, and people of conscience speak on matters of human rights. We cannot leave these realities to others. We, who are artists, poets, and writers, must add our voices to the swelling chorus that will one day, remove torture from our national vocabulary. Editor's Note: be sure to catch the reading and pick up the chapbook at AU on November 10.